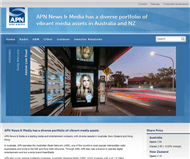 APN News & Media is a leading media and entertainment company with diverse assets in Australia, New Zealand and Hong Kong. In Australia, APN operates the Australian Radio Network (ARN), one of the country's most popular metropolitan radio businesses and home to the KIIS and Pure Gold networks. Through ARN, APN also has a licence to operate digital entertainment and live events brand iHeartRadio. APN also owns regional publishing business, Australian Regional Media (ARM) which engages with over 1.6 million Australians every week through the unique local content it produces across its extensive print, mobile, tablet and online asset base. APN's Hong Kong business Cody specialises in premium outdoor billboard advertising. APN also has 50 per cent ownership of Adshel, a leading outdoor and digital out-of-home provider and #1 street furniture network in Australia and New Zealand. 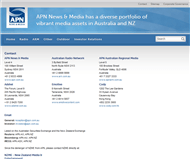 APN owns the Australian Radio Network, one of the leading broadcasters across the country. Its brands, which include the KIIS Network, Pure Gold Network, iHeartRadio, The Edge96.One and Mix106.3 Canberra, reach over four million listeners each week and is dominant in the commercially lucrative 25-54 demographic. ARN is one of the leading broadcasters in the country with ownership or investments in 13 radio stations nationwide. It is home to the national KIIS and Pure Gold Networks.The KIIS Network consists of KIIS 1065 Sydney, KIIS 101.1 Melbourne, 97.3 Brisbane, Mix102.3 Adelaide and 96FM in Perth. Each station delivers energetic and celebrity content, alongside music, that reflects the best that each city has to offer, and features some of Australia’s most well-known and successful personalities. The KIIS Network targets Women 25-44. The Pure Gold Network, targeting the lucrative Gen X demographic, reflects the music audiences want to hear from the 80’s, 90’s and 2000’s, that instantly makes you feel good and transports you back to those memories you have created throughout your life. Pure Gold stations offer content that is contemporary, confident and current. 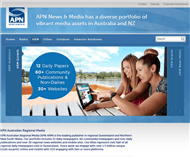 APN Australian Regional Media (APN ARM) is the leading publisher in regional Queensland and Northern New South Wales. Their portfolio includes 12 daily newspapers, 60 community newspapers and non-daily publications and over 30 regional news websites and mobile sites. Their titles represent over half of all regional daily newspapers sold in Queensland. Every week they engage with over 1.5 million unique locals via print, online and mobile with 21% engaging with two or more platforms. At the heart of their success is their commitment to connecting and enriching the communities they serve by creating the most relevant and engaging local content across print and digital channels to inform and entertain their readers. They are extremely proud of the bonds they have built with the communities that have made their mastheads an integral part of the community for over 150 years. With a publishing footprint from Coffs Harbour to Airlie Beach, APN ARM connects with over 1.5 million consumers every week, providing our advertising partners with highly targeted multi-platform media solutions to engage with regional audiences through local conversations, local content and local connections. APN Print operates major commercial printing businesses in Australia and New Zealand. With a strong emphasis on innovation and digital solutions, APN is at the forefront of outdoor advertising in Australia and New Zealand. They also have strong growing operations in Hong Kong. As a leading out-of-home media company, Adshel allows advertisers to connect, engage and influence commuters where they work, live, shop and play across Australia and New Zealand. Formed in 1997 as a joint venture between APN News & Media and Clear Channel, it is now one of the most recognised names in street furniture and a key player in the out-of-home media market reaching 92% of Australia 68 times a fortnight and 83% of the New Zealand population. Cody Out-of-Home is one of Hong Kong’s leading outdoor advertising companies specialising in billboard, transit, content and experiential marketing. Cody Roadside consists of a portfolio of over 180 premium billboards across Hong Kong. Cody Transit manages the advertising space across over 4000 bus screens and 500 taxis in the country. Cody Content creates specialist commercial content for advertisers to be utilised on Cody Transit screens; and Cody Ambient specialises in online to offline experiential marketing activations. Creating engaging content is integral to APN and its brands. In early 2015, content marketing agency Emotive launched with APN a founding investor and has experienced early success working with clients such as Woolworths, Optus and Virgin Mobile. In addition, APN has the licence to stream and manage content marketing business iHeartRadio in Australia focusing on custom content and events. Emotive is an independent content marketing business that brings a new model to the content marketing landscape. Helping marketers inject emotion into content creation, Emotive specialises in the creation of video content and events in entertainment culture. Uniquely, Emotive is able to offer its clients a ‘right audience’ guarantee by pinpointing the ideal consumer for the content, wherever they may be. Adding to Emotive’s innovative amplification model is a partnership with APN, which includes ARN and Adshel, giving Emotive special access to a huge weekly audience to further boost content distribution. As part of the partnership, Emotive holistically represents iHeartRadio, the world’s fastest growing digital music service.